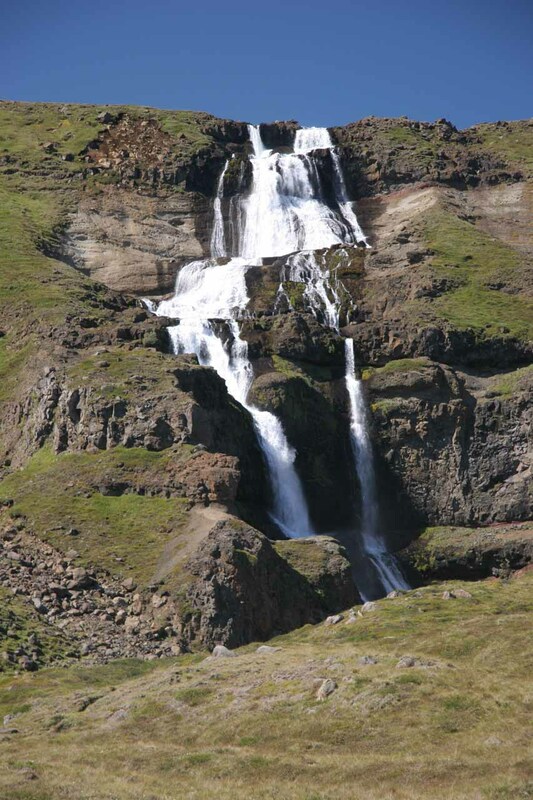 The waterfalls named Rjukandi referred to on this page (as there were many instances of waterfalls with this name in Iceland) pertain to the series of waterfalls we noticed along the Ring Road between the towns of Akureyri and Egilsstaðir (though much closer to Egilsstaðir – see directions below). 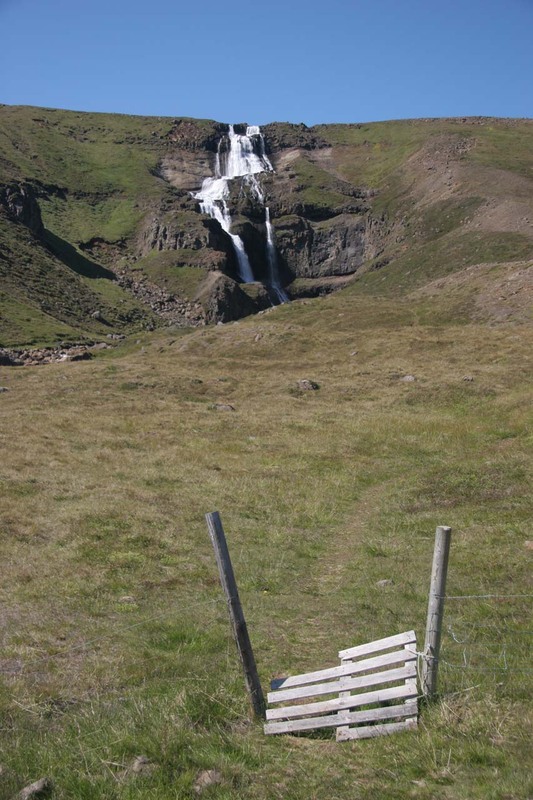 The falls resided in the East Iceland region. 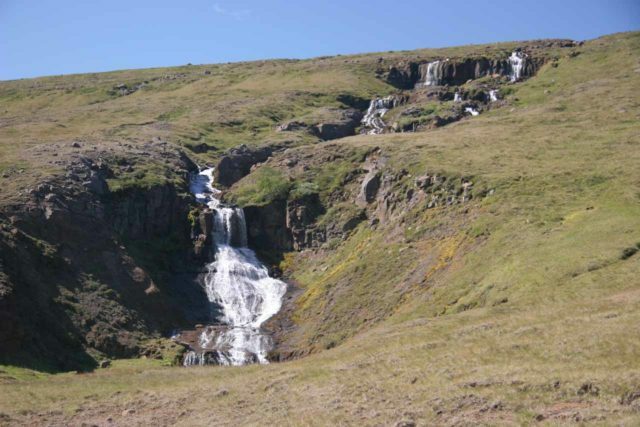 While the drive between the towns was long and the scenery was quite desolate (basically many rolling mountains and hills with some mats of grass and shrubs on them plus a few farms here and there), the waterfalls we noticed certainly stood out as a result. However, there were so many waterfalls along this route that it was quite easy to skip them and declare them too minor or too dime-a-dozen to stop for. 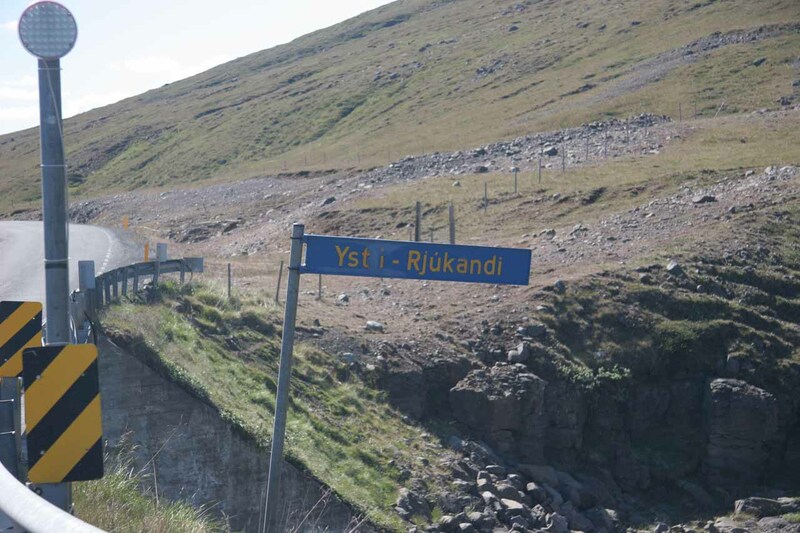 That was until we noticed this waterfall series where we a pair of signs indicating “Fremsti Rjukandi” (meaning “leading Rjukandi”) and “Yst-i-Rjukandi” (meaning “outermost in Rjukandi) helped us determine that perhaps we had stumbled upon something we ought to stop for. 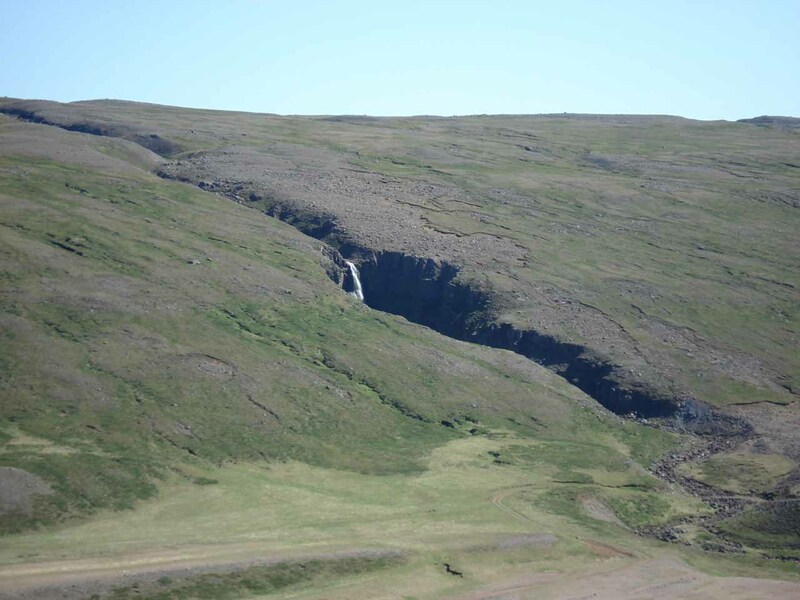 Then, very shortly thereafter, we noticed another series of waterfalls, which like the previous waterfalls were each significant and could’ve very easily had some tourist infrastructure to help people stop at these falls while also to help break up the long drive. 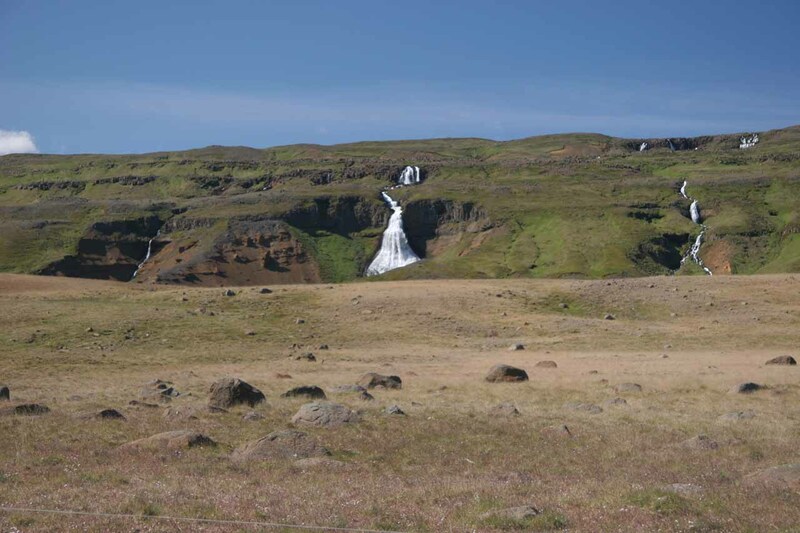 So that basically got us to literally stop in our tracks, turn back, and start stopping at what available pullouts that we could find for each of these waterfalls. 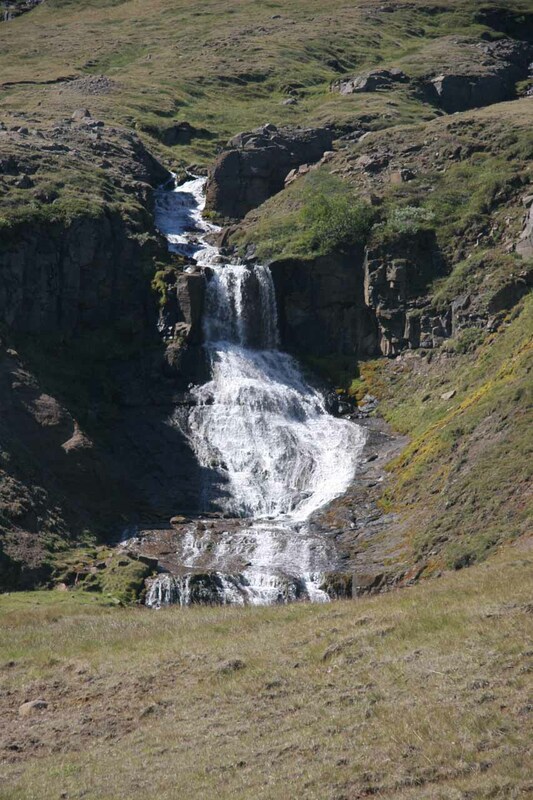 These waterfalls were essentially roadside waterfalls, but we did notice some short trails and stiles that appeared to allow us to get closer to the base of some of these falls. 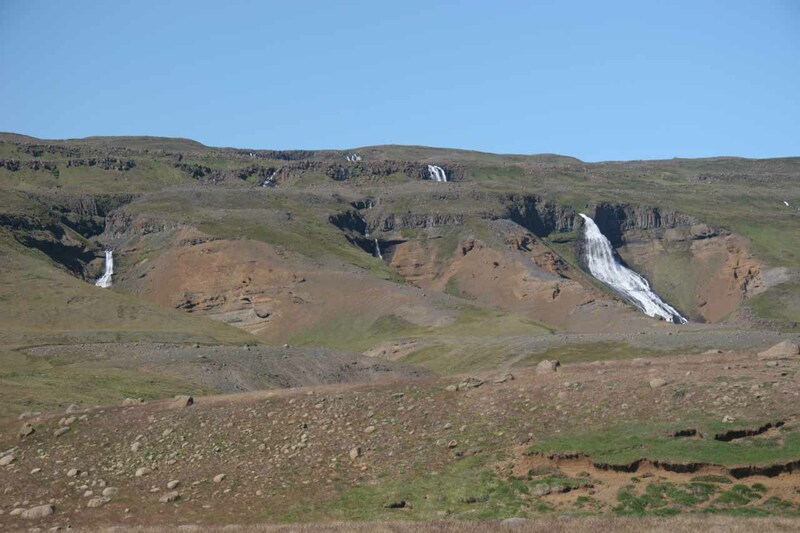 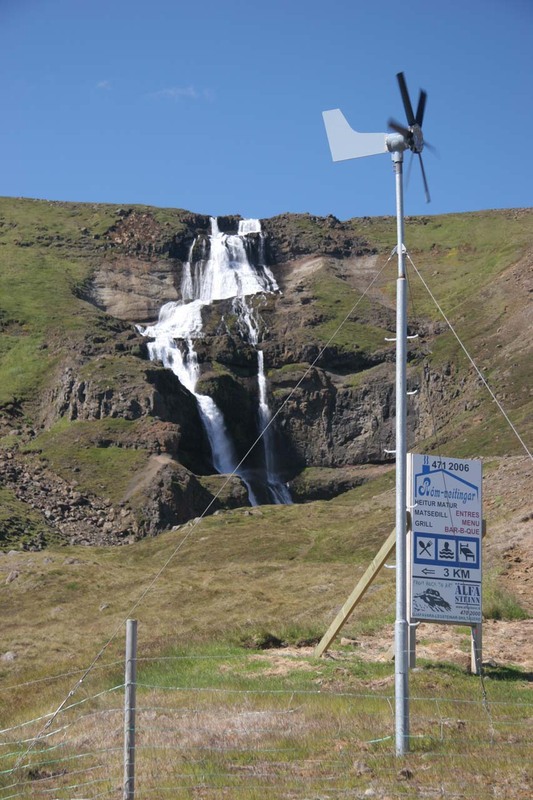 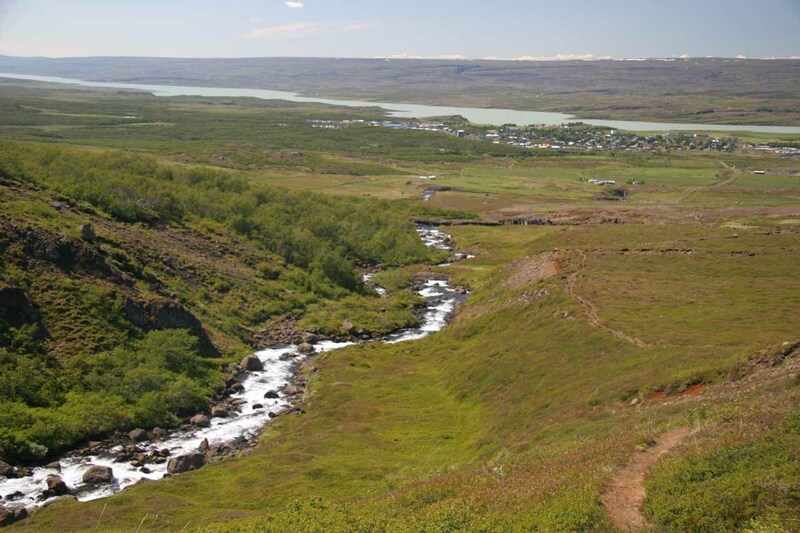 Assuming you’re seeing the waterfalls series at Rjukandi from west to east, then the appropriately-named Fremsti Rjukandi was about 215km east of Akureyri on the Ring Road (Route 1). 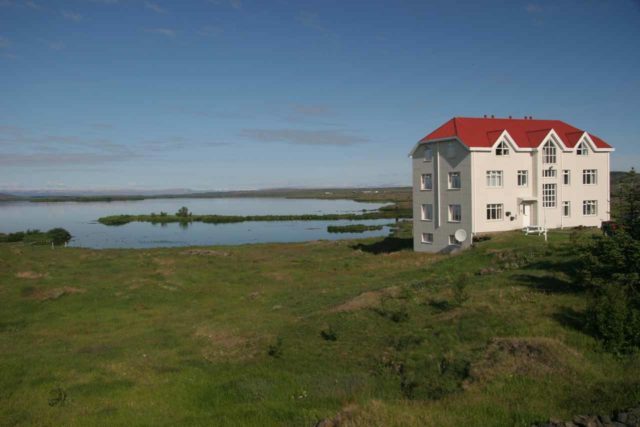 Since we did this drive from Reykjalið by Mývatn, the distance we had to travel east was 115km. I recalled that the “waterfall row” was just past a stretch of the Ring Road that was unpaved (though that was in 2007; it might be totally sealed now). 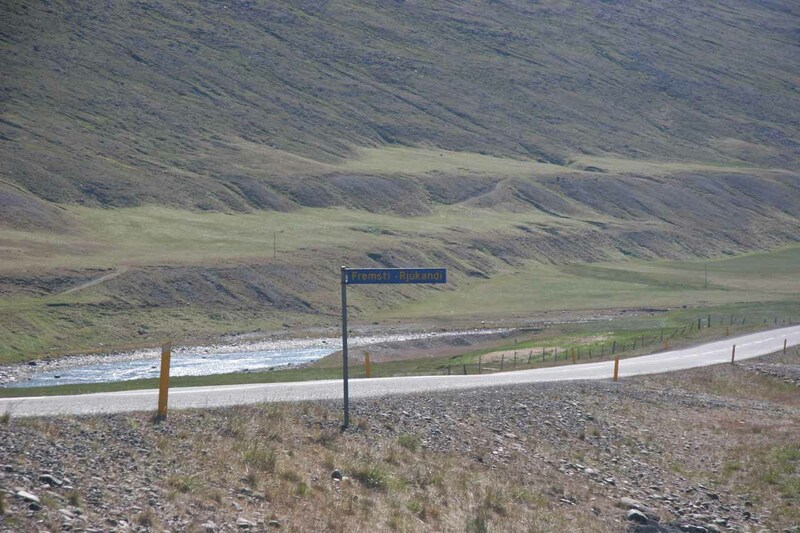 If you were coming from Egilsstaðir, then Fremsti Rjukandi was about 50km west on the Ring Road. 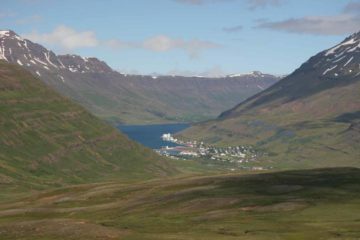 Yst-i-Rjukandi was only about 700m to the east of Fremsti Rjukandi. 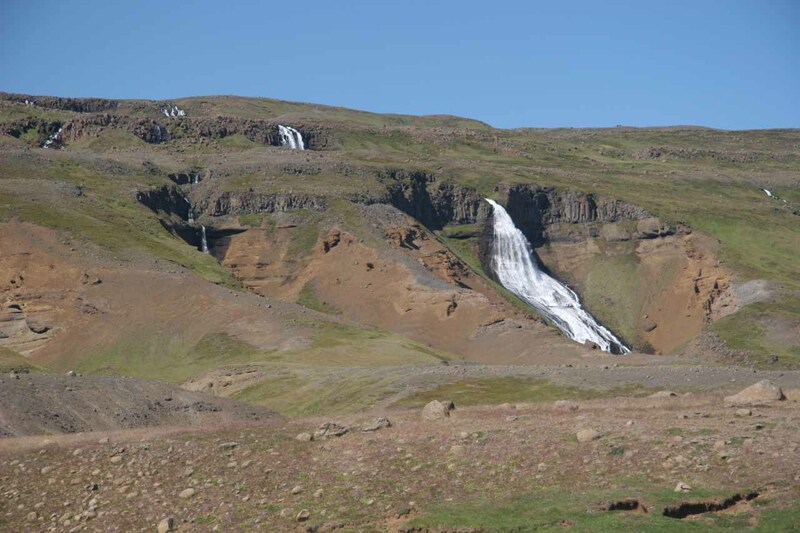 Then, the remaining waterfalls (probably going by different names such as Saudafoss and Staðarfoss, according to my notes) were 4.5km and 9.4km further to the east, respectively. 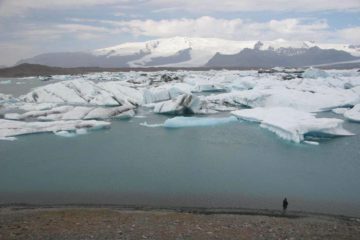 I’m sure there were others that I haven’t properly identified or even bothered to capture and present here. 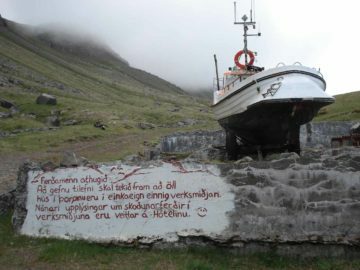 We’re just showing you what we happened to stop for. 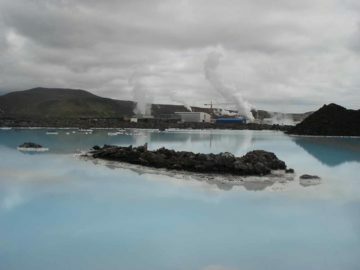 For geographical context, Reykjavík was 645km (7.5 hours drive) southwest of Egilsstaðir and 380km (4.5 hours drive) southwest of Akureyri.